India’s population density has risen from 325 per square km in 2001 to 382 per sq km in 2011. There has been an increase of 17.5% during the decade with land size remaining the same. Out of 304 million hectares of land in India for which records are available, roughly 40 million hectares are considered unfit for vegetation as they are either in urban areas, occupied by roads and rivers, or under permanent snow, rock or desert. During 2004-09 when Shri Lalu Prasad Yadav was Railway minister, Railway Land Development Authority was formed for acquiring lands for the purpose of railway expansions and for enhancing revenues through commercial use of unutilized lands. 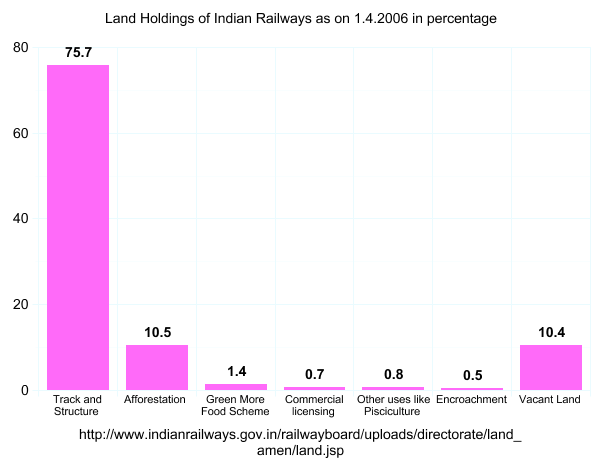 While there is no reliable statistics available about Public land ownership, it is estimated that Indian Railway owns the maximum land. RLDA also aims to prevent encroachment on railway lands and augment railways resources by exploitation and management of the valuable Railway Land in Metropolitan cities and major towns for commercialization and other revenue generating activities. RLDA is the statutory body for generating nontariff revenue from vacant and surplus railway lands. For example, many Indian hotels through the process public private partnership will set up multi-functional complexes at 75 railway station in the first phase (Business Line, Hyderabad, Sept 12). religious institutions/ staff welfare of organizations/ handicraft centres, social welfare centres and Bharat Scouts and Guides. When we travel in train we find numerous slums mushroomed along the railway tracks. These slums are particularly found when we approach a major city or town. It is understandable since cities and towns provide livelihood for slum dwellers who otherwise cannot afford the rentals in the cities. Below are some of the examples of slums along the railway tracks. In Surat district, 14 slums were identified by an NGO near the Railway tracks. These 14 slums house a population of 15,000. While these slums have electricity they lack potable water and sanitation facilities. The people staying here are marginalized communities of Muslims and Dalit struggling every minute of their life. Their condition is very pathetic when compared to urban informal slum dwellers of city. For the process of R & R any slum undergoes a survey according to RAY and JNNURM. Railway slums are not considered for R & R even if they are located adjacent to RAY identified slums. There is always a tussle between Private land, railway land and Surat Mahanagar Palika. Frequent visits by Government officials threatening to demolish these slums are very common. They become easy prey for extracting money due to threat from any Government official. Usually before demolition no notice is given to the slum dwellers. The notice is very informal in nature. Example: notices are issued only a day before the demolition. Notices are pasted either on walls or somewhere else. Slum dwellers are psychologically affected always living under the fear of demolition. When demolition happens then there is a lot of violence. The most traumatized are the children and women. A common phenomenon noticed was that many Municipalities never listed the new slums on Railway lands as slums but only considered and gave all the attention to the old ones for planned development. Safety is also one big issue. The ladies and children of railway slums have to cross the railway tracks frequently for various purposes such as fetching water,going to schools etc. The railway slum dwellers of these places have their livelihood usually within 1kms of their homes in nearby power loom industry. Surat is a place where liquor is illegal; as a result the children of the railway slum dwellers are used for selling illegal liquors. All the railway slum dwellers possess documents like identity cards, aadhar cards, ration card etc. According to an NGO survey, only 10% of railway slums get notification of demolition. A slum named Vinod Nagar in Dhanbad underwent a small survey by a local NGO whose findings say that- eunuchs and other socially marginalized communities live in the railway slums of Vinod Nagar. When an R & R of Vinod Nagar was undertaken the resettlements including schools were shifted to far away Forest lands. None of the people could relocate because it affected their livelihood. Usually after the findings reveal that the R & R in Dhanbad shift the school to areas far away like in Forest lands. All these people have voting rights as well. In Ranchi, a phenomenon is very common of Floating homes. Their homes are made up of plastic sheets. The railway slum dwellers due to the problem of demolition always fold their plastic bags and carry with themselves. During night they settle anywhere along the railway track and make their plastic homes. In Delhi we have public lands owned by various authorities like Railways, defence, airport, metro, forest lands etc. There are no water, electricity or sanitation facilities. The slum regularly suffers victimization. Due to sanitation problems, all slum dwellers both men and women are forced to defecate on the railway tracks. The women hence are vulnerable to regular abuses and struggles. This slum dwelling composes of Nomadic tribes of Uttar Pradesh. This slum dwelling is demolished every year. A very specific component noticed here is that when one authority demolished this slum dwelling then another authority takes responsibility of its R & R. For example – when Delhi Metro authorities demolish one slum then another authority like DUSIB rehabilitates those slums. Sewanagar is a railway slum in Vizag district. The people of Sewanagar have their livelihood in Railway itself as housekeeping and as contractual laborers. This slum was about to be demolished and resulted in job losses due to eviction. An NGO got associated with the slum and helped it to rehabilitate. A Land transfer proposal was issued where the land ownership from Railway was transferred. These households were allotted homes under JNNURM in Vizag. Railway has surplus lands in India. Only ‘very marginalized’ and totally secluded communities live in slums near railway tracks. Reluctance among Municipal Corporation with respect to notifying new Jhuggi Jhopri particularly when it is located outside the municipal area such as railway. There is a need to include all slums for planning purpose. The survey of slums happen only under the JNNURM and RAY. There is a need to identify appropriate officials for issues relating to such slums and promote accountability. There should be a common guidelines for handling R & R of all types of slums irrespective of their location. Many houses are evicted after Rehabilitation as there is lack of coordination among the various departments working in this area. Accountability mechanisms during Relocation and Rehabilitation are very ambiguous. Over a period multiple agencies have got involved in housing for city’s urban poor resulting in overlapping accountability. Coordination issues between various authorities need improvement. As noted in previous blog posts Slum Dwellers Disenchanted With Government Schemes , One Step at a time, and Information gap and disillusion as barriers , PRIA is working with other grassroots NGOs to help organize slum dwellers in 2 cities of Chhattisgarh – Bilaspur and Raipur – along with Patna and Jaipur. We chose to organize in these communities because these cities will be implementing the Rajiv Awas Yojana (RAY), a scheme for creating slum-free cities. Building community capacities for meaningful participation in RAY is one of the main short-term goals for our organizing efforts. Among the myriad possible challenges in implementing this scheme, one that has become a pressing concern in Bilaspur is coordination and clarification of responsibilities among different governing bodies. Many of the Bilaspur slums are hoping to participate in RAY, which will be implemented by Bilaspur Municipal Corporation but they live on land belonging to the Railway Department. Since the slums reside on land owned by a central government department, it’s not clear if responsibility for their rehabilitation lies with the Railway Department or the Bilaspur Municipal Corporation. The BMC does not have clear authority to make decisions about what happens to the railway slums, but the Railway Department has no clear obligations under RAY to deal with the slums either. The wording of the RAY guidance is vague. Landowning ministries are encouraged to “explore” options for innovative “pilot programmes.” This lack of clarity about the responsibilities of Central Government Departments and Ministries was addressed in a press release from the Ministry of Housing and Urban Poverty Alleviation (HUPA) on 19 December. We are told that a meeting was held with State Ministers in charge of Housing to discuss issues like this one and that this issue was “taken up in the meeting of Committee of Secretaries having representation of various land-owning Ministries such as Railways, Forest, Civil Aviation, Defence etc.” Several other meetings have also been held, but we are not told about any conclusions that may have been reached. We are simply told that the “Central Government Ministries and Departments have been requested to take up slum survey and other preparatory activities and prepare pilot projects for seeking Central assistance support under the current phase of Rajiv Awas Yojana.” It’s not clear whether this request will be enforced. Nor is it clear whether, in case a department feels no particular motivation to participate in this project or has no innovative ideas for how it might be successfully carried out, sound courses of action might be suggested. In Bilaspur, the slum-dwellers occupying Railway Department land are willing to be relocated. But the Railway Department has shown little willingness to negotiate about their compensation. The process of carrying out a survey, finding land for relocations, negotiating the lease rights or property rights to the new land (would it be other Railway land or would BMC be responsible for providing land? ), working with private-sector contractors to design new housing with community participation, and arranging for access to basic services would require years of effort. The incentive seems to be to get rid of the slum dwellers before the Department is required to deal with them under RAY. How can the other parties with interests in effectively working toward a slum-free Bilaspur tip the balance away from eviction? For their part, the slum dwellers are doing all they can. At the Slum Improvement Committee orientation organized by PRIA and SYM, the slum-dwellers pressed for answers from government representatives. They urged their elected leaders to advocate for their interests, and they held rallies to draw public attention to the issue. As reported in the clippings below, they have even given a memorandum to the Collector of Raipur District Thakur Ram Singh, Railway General Manager Arunendra Kumar, and DRM K.C. Trivedi requesting not to be evicted before participating in the Rajiv Awas Yojana and threatening a fast and self-immolation if made homeless. Nevertheless, they are still in dire straits, with eviction without compensation an imminent threat. How could this situation have been avoided? How should the RAY policy be clarified to address these kinds of situations?